Can I buy from a private party and still get a used boat loan? These are all good questions. Be informed about the process of obtaining a used boat loan and you’ll have more confidence, and probably save money as well. The first thing to know is that interest rates for used boat loans are low, low, low. Shop around and find the best rate you can. An experienced lender should be able to offer you competitive rates, good service, and an extended warranty of some sort. And since you will be buying used, that is a must. The advantage of buying used is that you aren’t paying for the steep depreciation of value a boat will see in the first two years. Buy a used boat that has been well cared for and save thousands of dollars on your used boat financing. Don’t forget to get it inspected, to verify the condition, and again, don’t skimp on the extended warranty. Boats are expensive to maintain, and the odds of needing maintenance goes up if you’re buying used. Even a used boat that is only two years old, and well cared for, should have an extended warranty. Whether you are buying from a dealer or from your neighbor, you can still get a used boat loan. That expands your options tremendously, and makes finding the perfect boat that much easier. If you are wondering how much of a used boat loan you can afford, the simplest way to figure that out is by using a loan calculator. You can quickly change any variable: interest rate, down payment, or terms, and instantly see it’s affect on your used boat loan monthly payment. Used boat loan terms can be as short as 8 years or as long as 20 years. It usually depends on the price of your boat. If your boat is more expensive, you’ll have longer to pay for it. But there can be other factors that determine the length of your boat loan as well. Your down payment, if any, could be anywhere from 10 to 20%. Some 20-year loans require a 25% down payment. Your lender will be able to help you determine the size of your down payment. When considering how much money to put down, keep in mind you may have some other expenses associated with the initial purchase of your boat. Are you going to be storing your boat on your own property? If so, are you going to want a cover for your boat, or an awning to park it under? What supplies are you going to need? Consider everything from life jackets to coolers. You may or may not want to use funds you earmarked for a down payment on your used boat loan for these purchases. Use the loan calculator to see how a $2000 difference in your down payment, for example, will change your monthly payment and see if it is worth it for you. Getting pre-approval for a used boat loan is a great way to increase your buying power. Sellers (dealers or private party) will know you are serious, and will be more willing to negotiate on the price. 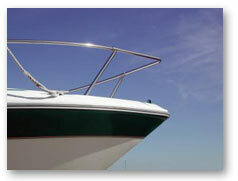 Your used boat financing company should have an online credit application you can fill out. By the next day, you should know exactly what you can afford and be able to find the boat that meets your needs, as well as your budget. You’ll purchase your dream boat knowing you are an informed buyer, and that you got the most for your money.